The duct tape roses from Abernook are wrapped just like real flowers along with a special gift card making them a truly unique and ultimate gift idea. The best thing about these roses is they don't need watering and they never wilt. Hoffman Estates, IL (PRWEB) June 14, 2008 -- The online gift specialists, Abernook LLC, announces the ultimate guy gift. Abernook, an online gift store selling unique gift ideas for special gift occasions, now offers the ultimate in guy gifts - Duct Tape Roses. "Duct tape is used in situations that require a strong and flexible adhesive. It is known by men as the "ultimate material". These handsome roses come in a variety of colors all created from that ultimate material - duct tape," explained by an Abernook employee. The roses can be purchased in sets of three and come with a special gift card explaining why it is the "ultimate gift". Abernook's Duct Tape Roses were recently featured in the Weekend edition of the Wall Street Journal as an eco friendly gift. These roses are the perfect gift idea for graduations, anniversaries, birthdays to husbands, brother, uncle, son, boyfriend, or nephew. The Duct Tape Roses are offered in many striking colors including silver, black, red, blue, pink and purple. An Abernook representative said that although silver is the most popular color, red was very popular for Father's Day. The line has expanded and Abernook is now offering flowers for the medical field created in medical tape and gauze. The Medical Flowers are perfect for RN's, LPN's, Doctors or professionals in the medical field and are made from durable, hypoallergenic all purpose cloth tape and extra absorbent rolled gauze. 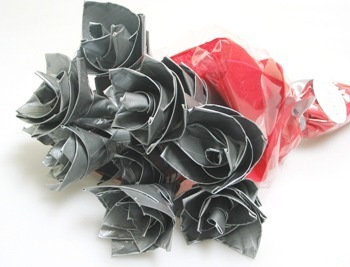 The Duct Tape Roses are manufactured and shipped by Abernook and are available wholesale and retail. The Duct Tape Roses can be purchased directly at Abernook.com. Abernook specializes in unique gifts to give and receive for men, women and children. Abernook carries a variety of personalized gifts, gift baskets, cookie bouquets, lollipop bouquets and jewelry for special gift occasions. For additional information contact Abernook at 847-304-1245 or send email to customerservice@abernook.com. Abernook and the Abernook logo are trademarks of Abernook, LLC.